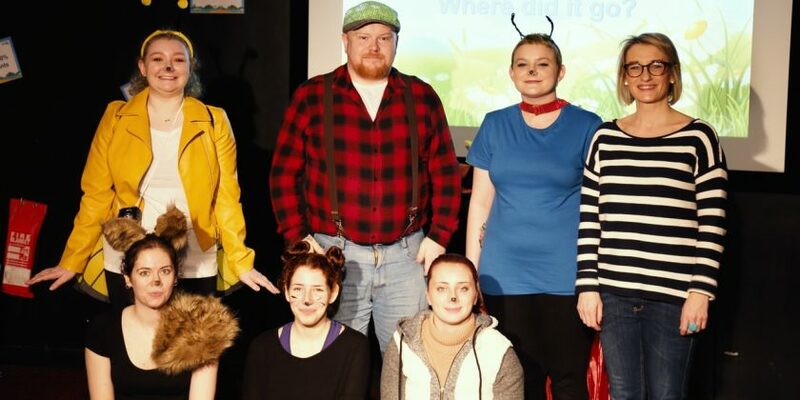 A group of toddlers at a local nursery were recently treated to a short production performed by theatre students at Wrexham Glyndŵr University. The performance, which was held in the Techniquest Glyndŵr science theatre at the university, was part of the Drama in the Community module on the University’s BA (Hons) Theatre, Television and Performance degree. As part of their work the Level 4 students were commissioned to devise a piece of theatre for a young audience, with the performance held in front of two and three years old from the university’s Little Scholars nursery. Senior Lecturer in Theatre, Television and Performance, Elen Mai Nefydd, explained: “This year we worked together with the Little Scholars nursery on the university site and have created and devised a short production for two and three year olds on the theme of Spring – the theme is something that the nursery are currently working on themselves. “This piece is an assessment on the module, which the students have written and devised as well as performing. It’s a great example of one of the areas of study that we specialise in on the degree – using drama in a community setting. spent time talking with staff at Little Scholars Nursery to discuss the brief for their work – and to find out more about their audience. The spring-themed performance was centred on Farmer Geraint and the animals and plants on his farm, and looked towards to coming of spring and the changes that the farm saw. Manager at Little Scholars, Catrin Davies, said: “I’d like to thank all the students who took part for their work, and for their attention to their brief. More about the university’s BA (hons) Theatre, Television and Performance degree can be found here.